Win Ice Cream for a year from the Chocolate Shoppe! 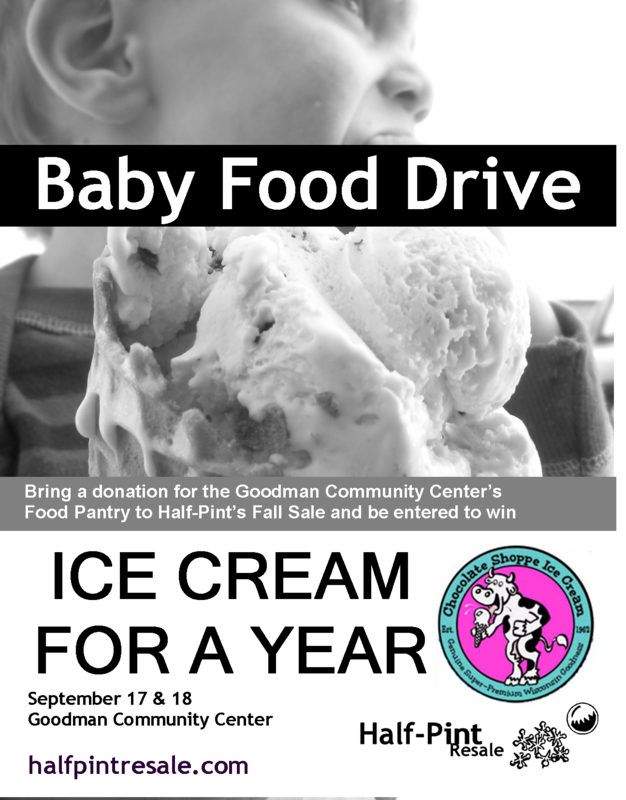 You could win Ice Cream for a Year from the Chocolate Shoppe just for bringing in an item to our Baby Food Drive during Half-Pint. “Are you Kidding?” you might say- ” Chocolate Shoppe Ice Cream is only the best ice cream in the world” Yup. Pretty awesome, hey? The Chocolate Schoppe Ice Cream folks have always been great to us (loaning us things like pails and tables) but this sale they are bringing it up a notch – and offering an absolutely FANTABULOUS prize for all of you folks who bring in a donation to our Baby Food Drive, running throughout Half-Pint. (That means baby food, formula, personal care products, and really, any food item, because a baby is only healthy if her momma isn’t hungry, too!) The food will all benefit the Fritz Food Pantry at the Goodman Community Center. Just put your item(s) in the big box in the lobby of the GCC Gymnasium, and then put your name in the bucket, and voila, one generous person will be chosen to win Ice Cream for a Year. It seems dreamy, doesn’t it? So this week, when you’re making your weekly trip to the Grocery Store, don’t forget to add in a few items for the Food Drive – and the Goodman Community Center, the Chocolate Shoppe, and all of us at Half-Pint thank you! PPS Want to make a financial donation to the Pantry and still be entered into the drawing? Write a check out to the Goodman Community Center, and in the memo write “Half-Pint Resale”. Give it to a volunteer during the sale, and we’ll make sure they get the money and you are entered into the drawing!